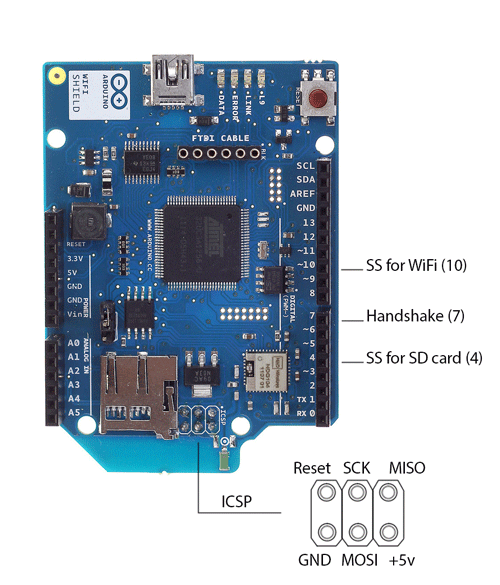 The Arduino WiFi shield allows an Arduino board to connect to the internet using the WiFi library and to read and write an SD card using the SD library. The WiFI library is similar to the Ethernet library and many of the function calls are the same. To use the shield, mount it on top of an Arduino board (e.g. the Uno). To upload sketches to the board, connect it to your computer with a USB cable as you normally would. Once the sketch has been uploaded, you can disconnect the board from your computer and power it with an external power supply. 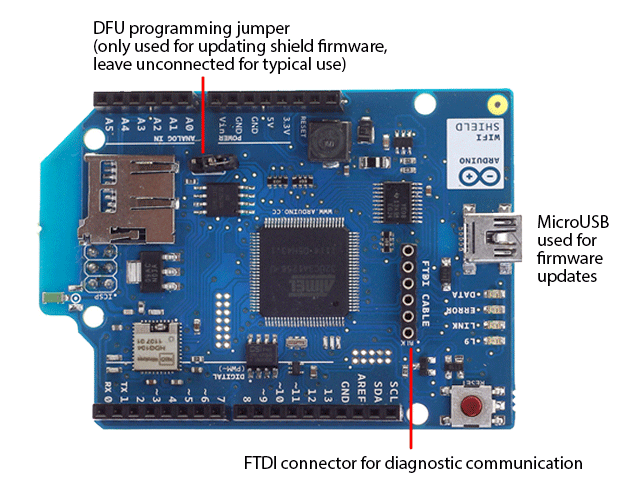 If you are using the WiFi shield with an Arduino earlier than the Uno rev3, you need to make the connection below for the board to work. The WiFi board uses the IOREF pin on newer Arduino pin layouts (Uno rev3, Mega2560 rev3, and later) to sense the reference voltage for the I/O pins of the board to which it is attached. 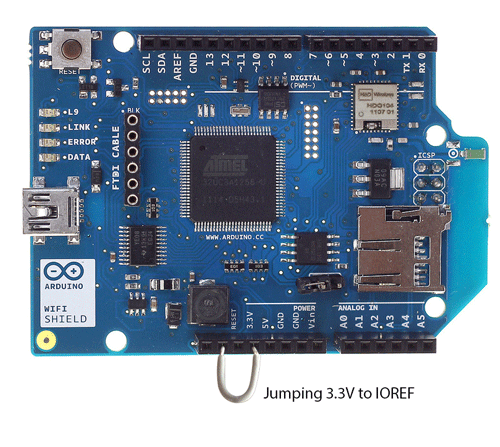 If you are using the shield with an older board, you need to connect the shield's IOREF pin to 3.3V. 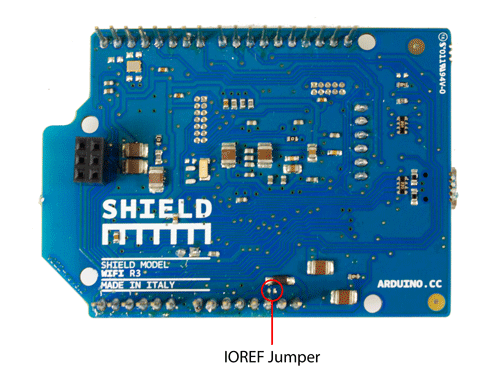 You can do this either with a jumper wire connecting IOREF to 3.3V as shown in the photo below, or by soldering the IOREF jumper on the bottom of the shield, shown below. WARNING: If you use the solder jumper, do not connect the shield to a rev3 or later board. To be safe, remove the IOREF pin on the shield. Otherwise, you will be shorting 3.3V to 5V through the IOREF pin. There is an onboard micro-USB connector. This is not for programming an attached Arduino, it is for updating the Atmega 32UC3 using the Atmel DFU protocol. The programming jumper adjacent to the power bus and analog inputs should be left unconnected for typical use. It is only used for DFU programming mode. A FTDI connection enables serial communication with the 32UC3 for debugging purposes. A list of available commands can be found here. The WiFI Shield includes a micro-SD card slot, which can be interfaced with using the SD library. The SS for the SD card is pin 4. 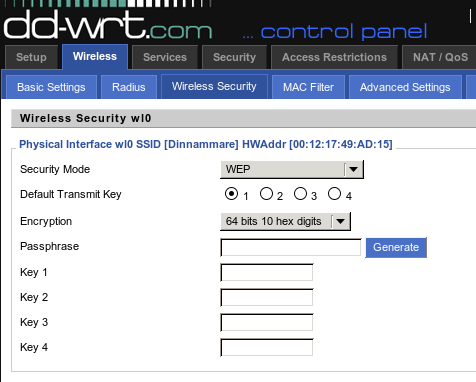 Refer to the WiFi library page for more information on the functionality of the shield, as well as further examples.